Did you love Cracker Jacks as a kid? I did -- the caramel corn, the peanuts -- one of my favorite treats! Most of all, of course, I loved the prizes in each box. 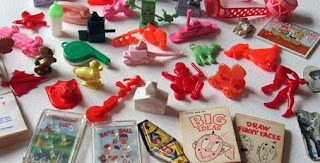 I remember they came in a paper packet and you got to tear the packet open to see what was inside. My favorite prize was always the tiny little dollhouse-size books. How about you? What Cracker Jack prizes do you remember? And which ones were your favorites? I'd love to hear from you in the comments! I forgot all about Cracker Jacks and the prizes. Yum. I always remember loving it, though. I honestly can't remember any of the prizes. I never got anything in the cracker jack box except stickers-so I always thought that was the only thing that came in them! I'm glad I'm not the only one who doesn't remember the prizes. But I DO remember always being disappointed in whatever I received. I usually gave the Cracker Jacks to my dad to eat. He loved them...especially the peanuts. I miss the actual prizes - they just got lamer as time went on to just the stickers! It's such a joy to read your posts! Love you throwback sense! Oh my! Cracker Jacks! This definitely takes me back to my younger years, we were always so excited about what was at the bottom of that little box.